That there Twitter thangy has its uses. My timeline had some mention of a new burger joint in the 'Swich, apparently very recently opened. When mentioning this to Kev, his little eyes flipped over to become miniature patties. He'd missed the last few light lunch outings. He sure as heckington wasn't going to miss this one. Come Thursday, the appointed day, Kev hands myself and Andy a folded A4 sheet containing an unbeatable offer for the opening week. Any burger plus fries for only £5. Nice one. Parking on Elm Street, I lead the way to Coytes Gardens thinking that the old sandwich shop will be the place. Not so. 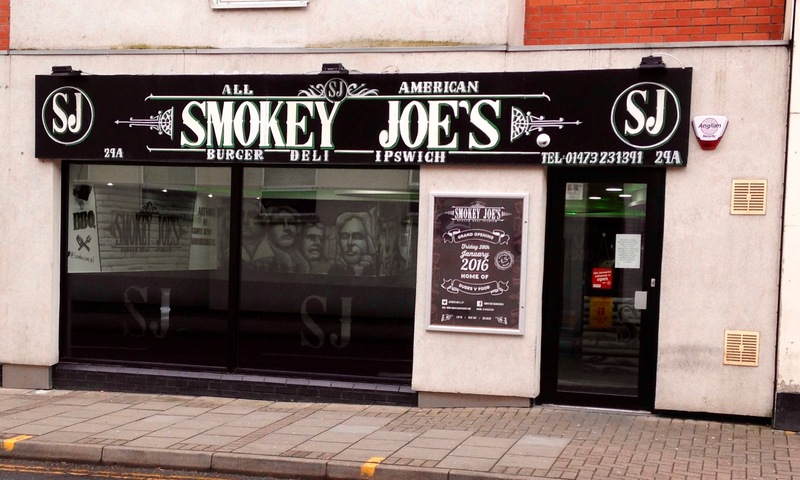 Round the Londis corner and facing Antonio Giovanni, home of hair, sits the "all American" Smokey Joe's. Gosh darn. I guess that previous Chipbis business didn't last too long. (Andy) New Yorker: double chicken, double cheese, BBQ sauce, etc. (Kev) Mac Attack: beef patty, double cheesy mac, Joe's ketchup, etc. (Ed) Big Tuna: grilled tuna steak, mint chilli salsa, etc. And all with fries, please. Wait for a bit, 'cos plenty of others in here too, then here come our platters. Oh my. More than enough to get your teeth into. Loved the tuna. Those fifty-somethings opposite me, the lightweights, didn't actually finish theirs, such was the quantity of food. Not quite the East Coast Diner, if I'm honest, but this is their opening week and I'd more than happily go back with the family in tow. It'll do well. If it was a car -- Cadillac Escalade. If they were passing by -- Kate Riley.